How Do I Treat Houseplants That Have Frostbite? Many houseplants are tropical foliage plants that thrive outdoors in mild conditions that mimic the indoor environment in many homes. For this reason, these plants are the perfect choices to freshen an indoor space -- as long as they are cared for properly. 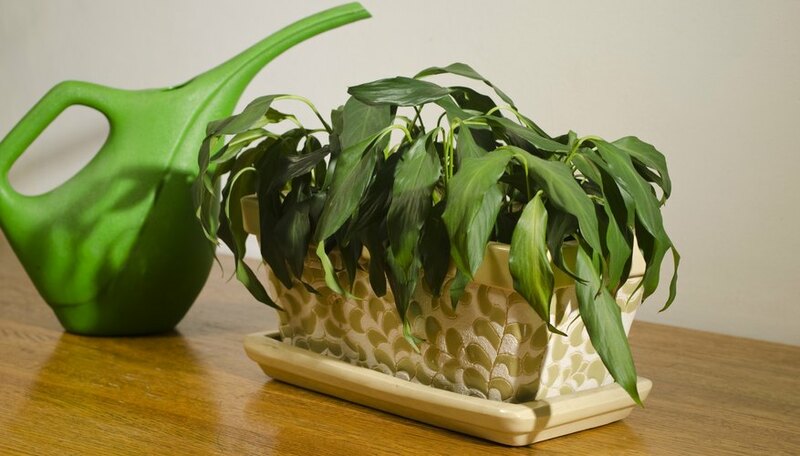 Although it may seem strange, houseplants can suffer frostbite in certain conditions. If the damage isn't too severe, however, they often can be restored to good health. You may think your indoor houseplants are toasty warm, especially if they catch some sun rays through windows. When the temperature drops, however, windows can become cold to the touch, and they can become cold to houseplant foliage touching them, too. In fact, the foliage can become cold enough to suffer frostbite. Plants close to windows also can get cold enough to be harmed, especially if the drapes are closed around the plants, cutting them off from the rest of the room and creating a cold environment. In some cases, houseplants can be frostbitten when left outdoors. Many houseplants benefit from being outdoors during the warm summer months, but they can quickly become injured if they are left outside when an early frost happens. Most tropical houseplants are damaged when the temperature dips below 40 degrees Fahrenheit, which is above freezing. Frostbite occurs in a plant when the water inside its cells freezes and expands. That process disrupts the flow of water through the plant, causing foliage to turn brown or black and shrivel. The leaves also may appear water-soaked. Frostbitten plant tissues are dead and will not recover, but that doesn't necessarily mean a frostbitten plant is a total loss. In some cases, only a small part of the plant is affected. It's usually simple to see whether only part of a plant has frostbite, and you might be immediately tempted to get out pruning shears and remove the blackened foliage. It's best to postpone that trimming for a bit, however, because this will allow you to see how much of the plant is still alive when it produces new growth. If your houseplants have frostbite, keep them warm, care for them as usual and wait for new growth to appear. Then pull out the pruning shears and cut away the damaged parts of the plants down to the new growth. To help prevent the spread of disease, disinfect your pruning shears by wiping teh blades with a clean, alcohol-soaked cloth before trimming and between cuts. Keep your houseplants healthy by placing them where they will not touch windows or be exposed to cold drafts. If you take them outside for summer, then move them indoors well before nighttime temperatures drop below 45 F. Some tropical houseplants can be damaged by temperatures below 50 F. Know what temperatures your plants can tolerate and move them indoors and outdoors accordingly. Setting indoor plants together will help them stay warm when you lower the heat during winter, such as when you go on vacation. Another option is to take them to a friend's house while you're away. If you're coping with frost-damaged landscape plants, see How to Care for Frost Damage in the Garden.